Last week, we had the pleasure of speaking with Powell player Katharine Rawdon during her visit to the Powell office in Mayanrd, Massachusetts. Katharine is a California native and is currently living in Portugal, where she is Principal Flute of the Orquestra Sinfonica Portuguesa. We were curious to learn more about the path that led Ms. Rawdon to Portugal and discovered that her experience with European countries and cultures began after she completed her undergraduate studies at Pomona College. Katharine was awarded the Thomas J. Watson Fellowship based on her proposal to study the “Woodwind Performance Styles in the Major European Orchestras,” which was a topic she conceptualized and finalized under the guidance of some of her professors. She was first chosen for the Watson Fellowship program within her college and then went through the national process, where she was selected to study her proposed topic. Katharine told us that she “grew up on the Beethoven symphony recordings with the Berlin Philharmonic Orchestra” when James Galway was Principal Flute. At the time she prepared to embark on her study of the European orchestras, Galway had been out Berlin for about seven years, but his legacy carried through in the recordings. She hadn’t expected to see too much diversity from orchestra to orchestra, yet her findings during the fellowship year were quite different. 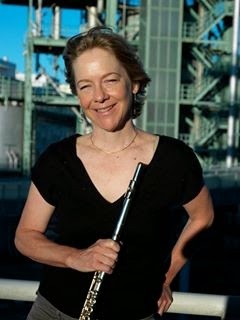 She shared, “Every culture has a very different idea about everything, including the function of music in society,” adding, “the study was essentially a sociological story within the construct of music.” During the study, Katharine noted one could “hear immediately that he approach of each orchestra was different,” and this was apparent within the woodwind sections as well. Ms. Rawdon’s study took place in the 1980s and was one-year in length, but it was only the beginning of her time in Europe. She returned to the United States, where she completed her Masters in Music at the Manhattan School of Music (MSM). She also performed in the National Orchestral Association (NOA) Orchestra for one year, after which she joined the Manhattan Wind Quintet with fellow classmates from MSM. When Katharine was a member of the NOA Orchestra, the ensemble was led by a Portuguese conductor. The conductor later organized his own orchestra in Portugal and extended an invitation to Katharine and the entire Manhattan Wind Quintet to serve as the core players in the orchestra’s woodwind section. Although this particular assignment was only supposed to last 6 months, Ms. Rawdon became very fond of the Portuguese culture and the environment, which led to additional teaching and performance engagements. We enjoyed our visit with Katharine and encourage you to read her previous post on this blog, “Technique vs. Expression,” which you can view by clickinghere to follow the link.